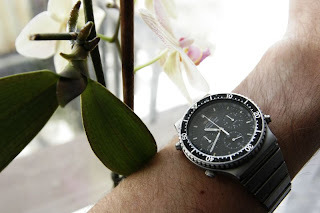 Second shot of this month is Seiko Military Quartz Chronograph 7a28-7040. This is very interesting model with fully (15) jewelled quartz chronograph (no plastic parts!) with split second function. 40mm case is beadblasted, 100m water resist, with bi-directional diving bezel. Crystal is scratched, bezel also - but this is wabi, and I like it :) Really nice watch - actually my EDC.